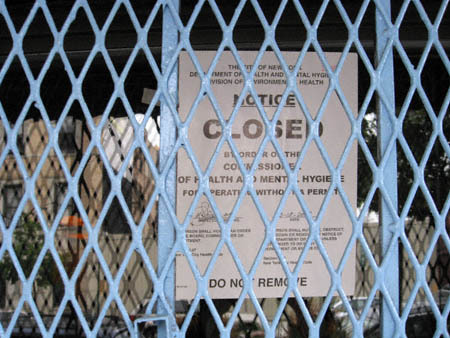 Casa Mon Amour was shuttered by the Health Department this weekend. Per the notice posted in the window this establishment was “operating without a permit”. I suspect I speak for many when I wish Beatrice godspeed in ironing out her paperwork woes with our fine city. noooooooooooo……i was craving their ceviche. and their sangria. dammit! i guess i have to comfort myself with habitat’s delicious sangria (though sadly they lack ceviche). Great. One less place to eat in this hood. The best part about this place was that you could actually get a seat for brunch in there while everyone else was waiting around at Brooklyn Label. hey! looks like they are up and running again. the chalkboard was out and the place was filled when i walked by around 8:30pm. i had seen the owner and her staff with potted plants and cleaning the inside of the place a few days before, but didn’t want to get my hopes up. what a relief!